The story of The Amazing Screw-on Head is simple, funny, and slightly satirical. 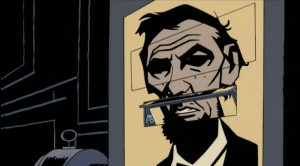 I loved that the story takes place during Lincoln’s administration, for there is something inherently funny about Lincoln in the white house planning out zombie attacks. 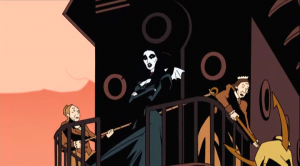 There are so many elements to make you palm your forehead while reading or watching– Screw-on Head’s jealous and frenzied vampire lover who is aptly named Patience and an evil turnip that is capable of bringing about the apocalypse. 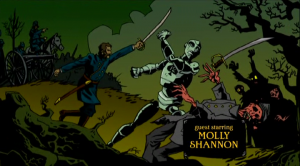 This is one of those rare occasions I will say the film/TV adaptation of a comic is better. The TV pilot has much more fleshed out backstories for each character, making the experience as a whole all the more engaging. We learn why Emperor Zombie is seeking to destroy Screw-on Head and the world, and he becomes a character with a story instead of a character who popped up out of nowhere with a vengeance. 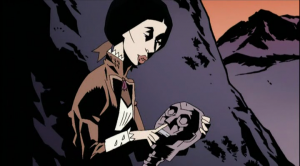 Mignola and Fuller also develop the story behind Patience’s love for Screw-on Head, and even Mr. Groin plays a more critical role. And, of course, zombie/mythical beast action scenes are just so much better on screen. I’m very disappointed The Amazing Screw-on Head wasn’t taken up for a full-fledged series. Personally, I thought the pilot showed a lot of promise, and I would’ve loved to see some good black comedy occult romping through the Lincoln administration on TV. That’s one hell of a creative team. I know you lent me this a long time ago, but after reading this I actually feel way more motivated to watch it (…you know me and my inability to watch things), given that… I now know what the actual concept is. I mean, otherwise, what am I to make of a title like that, I ask you?